The Blue-headed Parrot (Pionus menstruus) - also known as the Blue-head Amazon or Red-vented Parrot, is endemic to tropical Central and South America, from Costa Rica and Trinidad south to Bolivia and South to Central Brazil. They inhabit forests and terrain with trees up to a height of 600m or 2000ft, but are occasionally seen up as high as 1500m or 5000ft - however, only in favored feeding places in open country and cultivated areas. During breeding season they fly in large flocks and can be seen in the mornings flying from the regular breeding sites to their feeding areas. At dawn or at dusk, large numbers of them are seen roosting communally in palm and other trees. The Blue-headed Parrot is a medium-large parrot, averaging 11 inches (28 cm) in length and its weight range is between 200 to 260 grams. 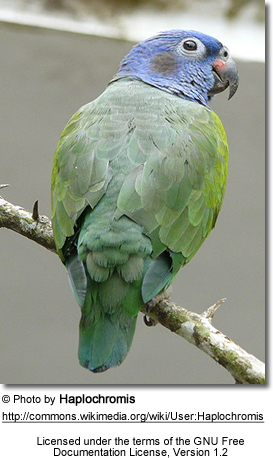 The plumage of the adult Blue Headed Pionus is generally green. The head, neck and upper breast are a deep blue. There is a red base on the feathers on their necks that show through. They have black patches on their ear coverts (feathers covering the ears) and the undertail is red. There is some yellow on the wing coverts. Their bill is blackish with red at the sides. The skin around their eyes (periophthalmic ring) is grey and their irides (= plural of iris) are a dark brown. Their feet and legs are grey. Both males and females look alike. DNA or surgical sexing is recommended for those desiring to determine the gender. Immatures have less blue on the head. Younger birds have a reddish frontal band [a few red feathers right above the cere (nose)]. The number of red feathers varies greatly with individuals, and these red feathers usually fall out by the time the pionus is 3 months old and are completely gone by the time the pionus reaches 1 year of age. The blue color is close to complete at one year of age. However, the blue can increase in intensity until about the second year of age. 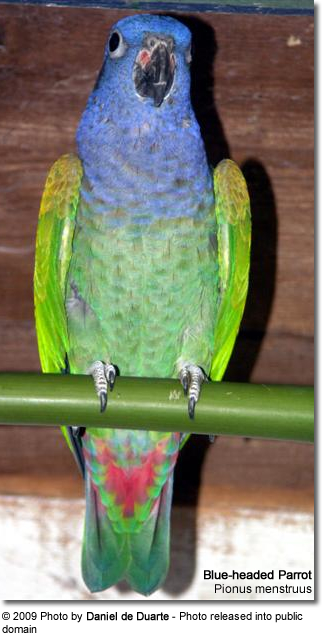 When the pionus is 2 to 3 years old, they will have attained full adult coloring. They feed on fruits, seeds, berries and blossom. They are also considered "crop pests" as they cause considerable damage to cornfields. Blue-headed Pionus Parrots are increasingly popular as pets. They are very affectionate and although they are not birds that particularly enjoy being cuddled, they do love a head scratch. They are quite independent birds, they are happy to amuse themselves with toys and food without constant attention from the owner. Well-socialized pionus parrots really enjoy interacting with people. They can be noisy with light, high-pitched squeaking calls. 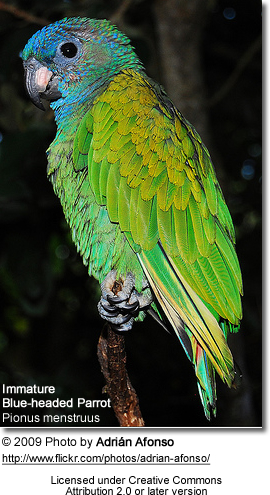 However, compared to other parrot species (conures or amazons), they are relatively quiet. They talking ability is generally considered "poor" - although some say they are the best talkers in the Pionus family. They are appreciated for their sweet and fun disposition, easy-going personality and intelligence. They are less apt to bite than other parrots species. These qualities make this parrot a good choice for first-time parrot owners and a wonderful family pet. The breeding season usually commences in May. In their natural habitat, they nest in tree cavities. A normal clutch consists of 3 to 4 (occasionally five) white eggs. The average incubation period is about 26 days. The young wean when they are about 12 weeks old and are usually independent by 3 months of age. They reach maturity at 2 to 4 years. 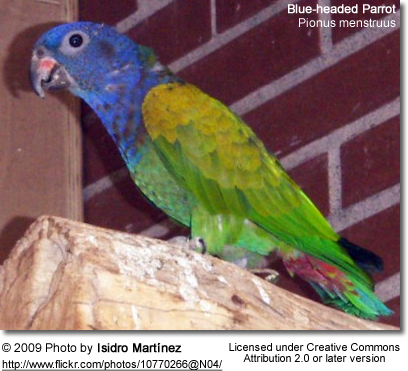 The Blue Headed Pionus is bred regularly in captivity and is moderately difficult to breed in captivity. During the breeding season, they can get noisy. If you have near-by neighbors who are sensitive to noise this should be a consideration when deciding to breed this species. They are breeding age when they are about 3 to 5 years old. In North America, the breeding season stretches from February or March to June or July. For cage construction, breeders suggested the following dimensions: 5 x 1 x 2 m (8.5 x 3 x 6 ft). Suspended cages facilitate sanitation as droppings and discarded food fall through the wire cage floor. Grandfather-style nest boxes work best. A size that works well is 10" wide x 10" deep x 18-24" high (~25 x 25 x 50 cm). Place the nest box high up in a dark, secluded area of the aviary. Pionus chicks are challenging to handraise and it is best to allow the parents to take care of the chicks for at least the first week. Various green foods and mealworms are appreciated by the parents for feeding the chicks. Corn cob is a favorite weaning food. Description: Looks like the nominate species described and featured above, but this sub-species has a much duller blue to its head; and the red to throat is more marked. The green is generally darker. It averages 10.5 inches (27 cm) in length. 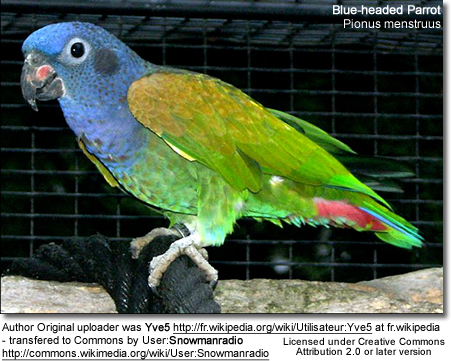 Description: Looks like the nominate species described and featured above, but generally has a deeper blue coloration. All green feathers are marked with blue, so this sub-species looks like a blue version of the nominate species. Its bill is horn-colored without a reddish tinge. It averages 10 inches (26 cm) in length.